As concluded by the Alzheimer’s Society they estimated in 2014 that there are over 800,000 people in the UK living with dementia. It is said at least one in three people over the age of 65 will develop dementia, whilst two-thirds of people with dementia are women. It is increasing at a very alarming rate and in East Midlands alone, the Alzheimer’s Society estimated that this will increase to 84,000 by the end of 2020. As defined by the World Health Organization, “Dementia is a syndrome in which there is deterioration in memory, thinking, behaviour and the ability to perform everyday activities”. Based on this fact, and what health professionals have witnessed in people living with dementia/Alzheimer’s, it can be concluded that it is highly important to make their care, treatment and support as accessible as possible. Treatment is taken care of by the state here in the UK, however, many of our older adults living with dementia are having to pay for their own care and support in the community. Paying for the services is hard enough, but having to live with non-personalised care and support is even harder. This is why we have come up with these reasonable and adjustable accessories that would enable care assistants (especially those supporting them for the first time), to have a more personalised plan that is not always in the care plan which is given to them by their relevant care agencies. According to the National Institute for Health and Care Excellence ‘Person-centred Care’ guidance published in 2011, it states, “this guidance aims to promote person‑centred care that takes into account service users’ needs, preferences and strengths”. For service users’ preferences, needs and strengths to be taken into account and offered adequately, the requirements must be known to a very understanding degree, and for people living with Dementia/Alzheimer’s, it is usually a struggle, as many are not prepared for the syndrome. Although care assessment is carried out by care agencies and healthcare professionals before care assistants begin their assignments, however, the care plans still always miss out on other important points that are very particular to each service user. 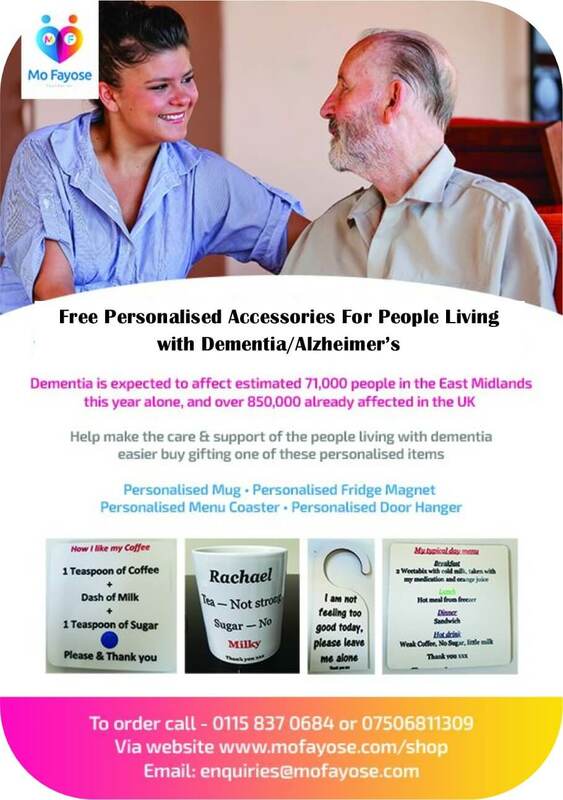 Free personalised accessories that explains to care assistants what makes the person they are supporting and caring for unique, stating with the knowledge of their favourite spoon, how they like their cup of tea etc. The personalised items can be ordered by downloading our form, get it signed by a GP or nurse (who has been caring for the person), send or email it back to us and we will send the free item for free to the address on the form. Caring for our vulnerable people is everyone’s business, it may be your turn to need the support tomorrow. download the confirmation of diagnosis & consent form. Please complete return.